Day One: 2018 Week of Action Kicks Off with Local Events Across the Country! We are kicking off the 2018 Dignity in Schools Campaign Week of Action Against School Pushout with actions and events in ten cities today! You can see an interactive map for information on all the events taking place across 22 states throughout the week. 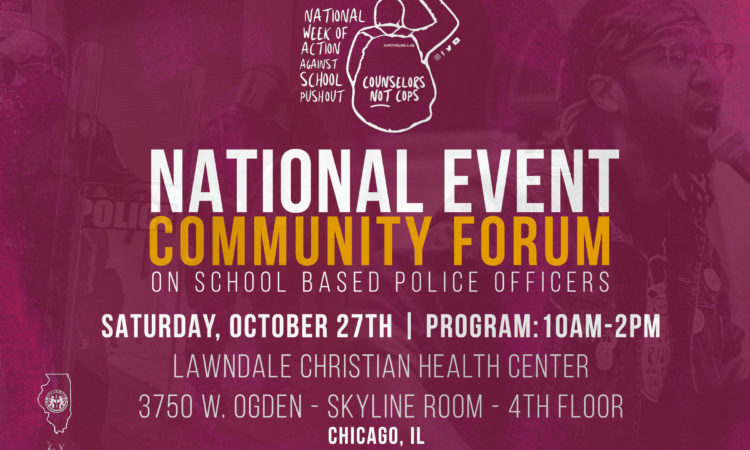 Today on social media, we are focusing on our Demand #1: Shift funding from school police to counselors, peace builders and positive discipline. You can show your support by using the hashtags and sample tweets included below. Central Vally, CA – Central Valley Movement Building released a press statement documenting high rates of suspensions, expulsions and referrals to law enforcement in Central Valley schools, and large investments in school policing instead of meeting students’ needs. Read the statement here. Washington, DC – Advocates for Justice and Education will be joined by youth leaders from Critical Exposure and others for A Call to Action on Solutions Not Suspensions from 10am to 4pm. Take your advocacy to the next level: Testify! Truth to Power, Art as Activism, New School Discipline Law. Location at AJE, 25 E Street, NW. RSVP here! Sunflower County, MS – Sunflower County Students and Parents United will launch a series of week long events to bring students and parents together to discuss school pushout and implementation of the Every Student Succeeds Act (ESSA).